A slope may be a gradient, inclination, or a pitch. And the formulas are needed to calculate the steepness of a straight line. The higher would be the slope, the steeper it would be. This slope is popular as the rate of change in mathematics and physics. The slope is responsible for connecting multiple points together over a line. The rate of change is easy to calculate if you know the coordinate points. 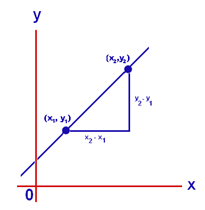 With Rate of Change Formula, you can calculate the slope of a line especially when coordinate points are given. The slope of the equation has another name too i.e. rate of change of equation. The value may be either positive or negative that signified the increase or decrease ratio between two data points. If there is some quantity whose value is same over time then it is named as the zero rate of change. Briefly, the rate of change simply tells the amount by which one entity affects the another. Well, the rate of change at its simplest denotes the amount at which one entity is affected by another. Take an example of a Company simply interested in job creation or employment. So, how much jobs he needs to create currently and how it will be expanded in near future is necessary to know before you start the process. For this purpose, ROC (Rate of Change) model works the best. It will give a perfect idea of numbers where you should start and how can you expand immediately. With a ROC model, this is also easy to calculate the growth rate of population or salary revised rate etc. With a careful application of ROC mode, you would get to know how applicable it can be to compute the tough problems. f(a) and f(x) is the value of the function f(x) and a and b are the range limit. If the value of one coordinate increases significantly but the value of the other coordinate is the same then the rate of change is constant here means it always is the same. Basically, the graph would be a straight line either horizontal or vertical line. So, constant ROC can also be named as the variable rate of change. In the case of constant ROC, acceleration is absent and graphing the solution is easier.